When we first walked through our now, new home, I fell in love with the kitchen. 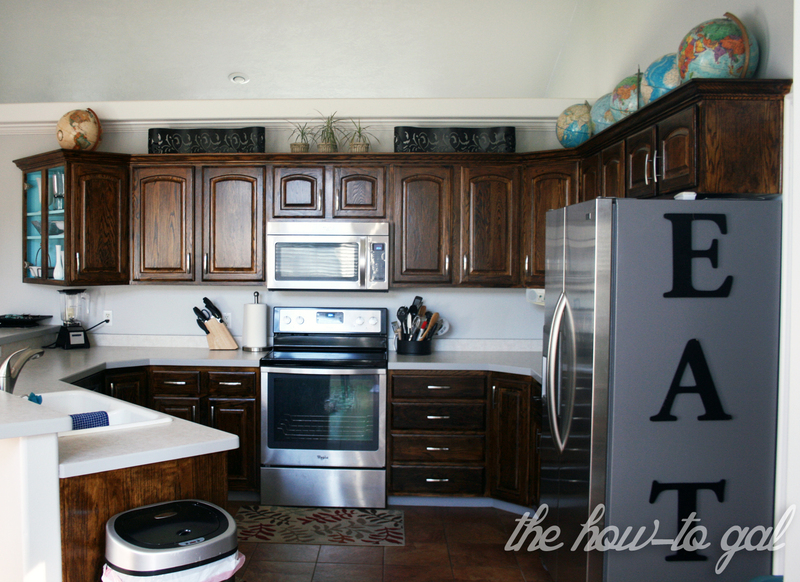 The open layout was one of the best we'd seen and the counter space and cabinets were plentiful. I loved that it was closed off from the front of the house but open to the dining area. I especially loved that I could look out the window while washing the dishes. 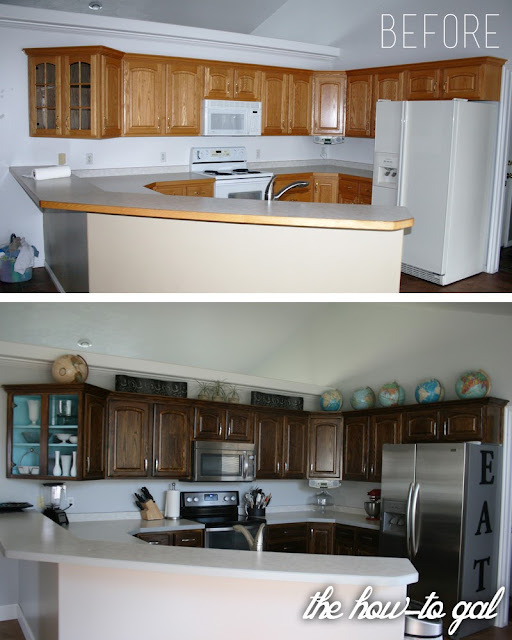 The only thing I didn't love was how the cabinet color and appliances dated the space. But I knew with a little bit of love, it could be my dream kitchen. If you follow me on Facebook or Instagram, you already know that I've been working on this project for awhile. Weeks! 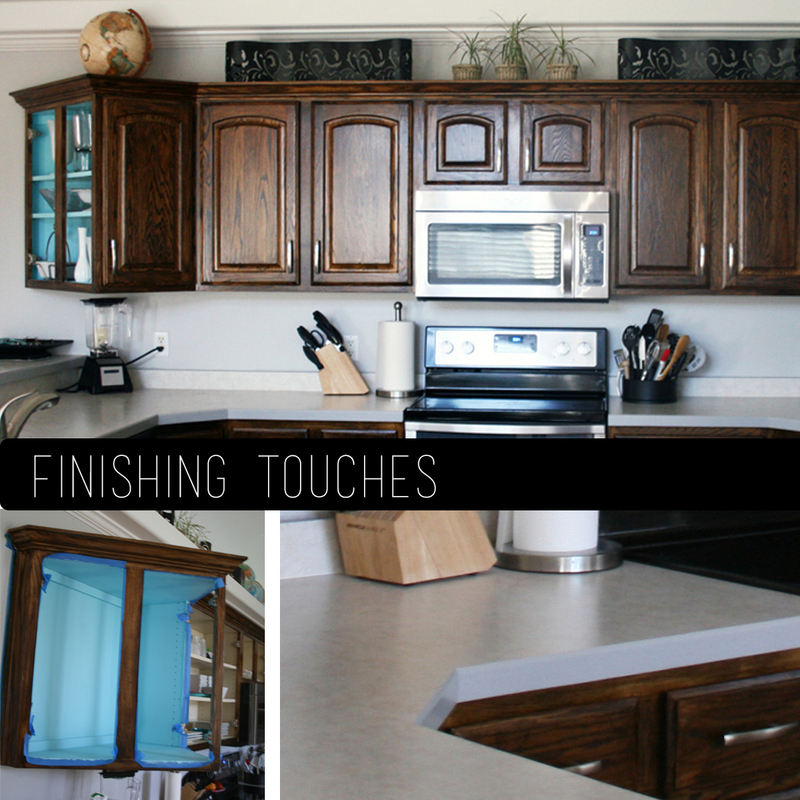 But I'm finally done and I've created a tutorial so you can update your cabinets, too. Now, I'm in NO WAY saying that refinishing your kitchen cabinets is easy. It's not. It's hard and time consuming and aggravating... BUT it is so amazingly satisfying to update your kitchen for under $300. You heard me right, $300. Want to see how I did it? Clean out all of your cupboards. I put everything I could on my kitchen table and covered it with an old sheet. Whatever isn't covered will be dust coated - promise. Tape off where the cabinets meet walls, floors, etc. Cover your counters with old newspaper. Set up a work station in your garage or some other covered area to work on your cabinet doors. We chose to use paint stripper to remove all of that cooked-on polyurethane on our kitchen cabinets. We used all three of these products and each worked, but we thought the Klean-Strip paint stripper worked the best (picture in the middle). Read the instructions on the back of your polyurethane. Each one is different. Once the stripper has done its job, you should be able to scrape off the old finish with a plastic scraper. I used my Pampered Chef hand scrapers, but you can find scrapers right next to the poly at Lowe's or Home Depot. The stripped poly will be gloopy and gross. To avoid gumming up your sander, remove any excess junk with mineral spirits. Makes sure the wood is fairly clean from the stripping step. Sand, sand, sand. Until your fingers, back, wrists and eyes hurt. 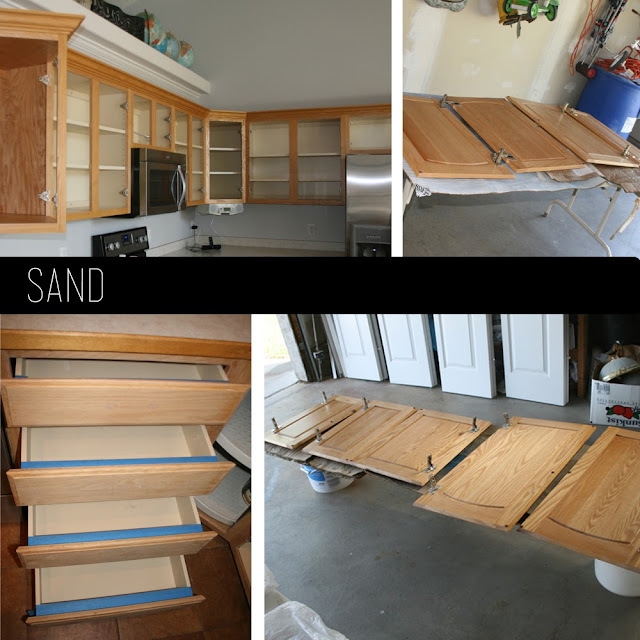 Sand until you're sure every ounce of old paint, stain and polyurethane is off of your cabinets. Sand until you can feel the bare wood. 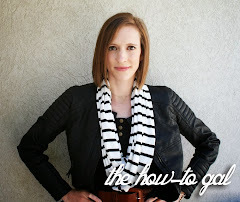 This is the step to take the most time on. Don't skimp. Don't cut corners. Dig in and sand, sand, sand. We used an orbital hand sander, a detail sander and just plain old sandpaper. To remove all of the previous layers, use a coarse grit, like a 60 or 80. Then, once you've got it down to the wood, use a fine grit to smooth everything out. The wood should be smooth to the touch before you head to the next step. Items needed: Stain (we used Minewax Dark Walnut), white socks, rubber gloves. Staining is, by far, the best part of this process. I'd even go as far as saying it's fun! After you've spent hours, days sanding the cabinets down to the bare wood, you finally get to stain them. The staining process goes really fast. I'd compare it to Thanksgiving dinner. You spend all day making the food (sanding) and it takes 15 minutes to eat everything (stain). The secret to staining is simple. Ditch the brushes and use your hands. Put on a rubber glove and then a white sock over that. By using a sock you can use your fingers to get into all of the nooks and crannies of your wood. Apply the stain, let it sit for a few minutes and then wipe off the excess. Depending on how well you sanded, the type of wood and how dark you want your wood to be, the time you let the stain sit varies. We rubbed our stain in after a few minutes. Once the stain is dry, you can add an additional coat if desired. Review your particular stain's directions for dry and recoat times. Because we chose not to remove our cabinets. We sanded and stained the cabinets right on the kitchen wall and worked on the doors in the garage. This worked for us, but we did live in the middle of a construction zone for about a week. 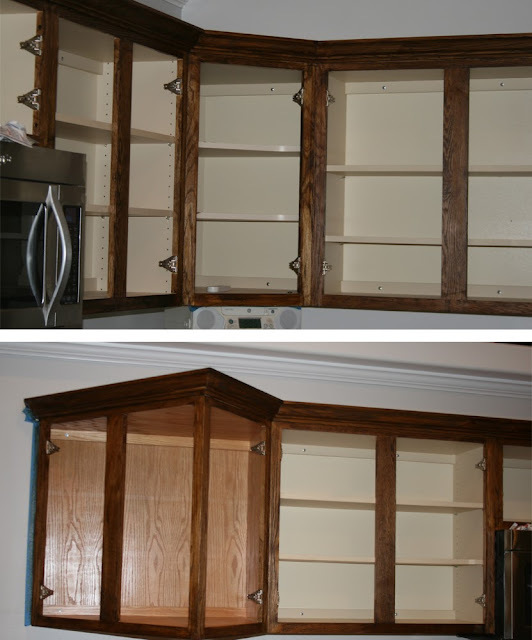 You must be sure and remove every speck of dust off of your cabinet doors before applying polyurethane. We scrubbed every crevice with steel wool, rags and mineral spirits. 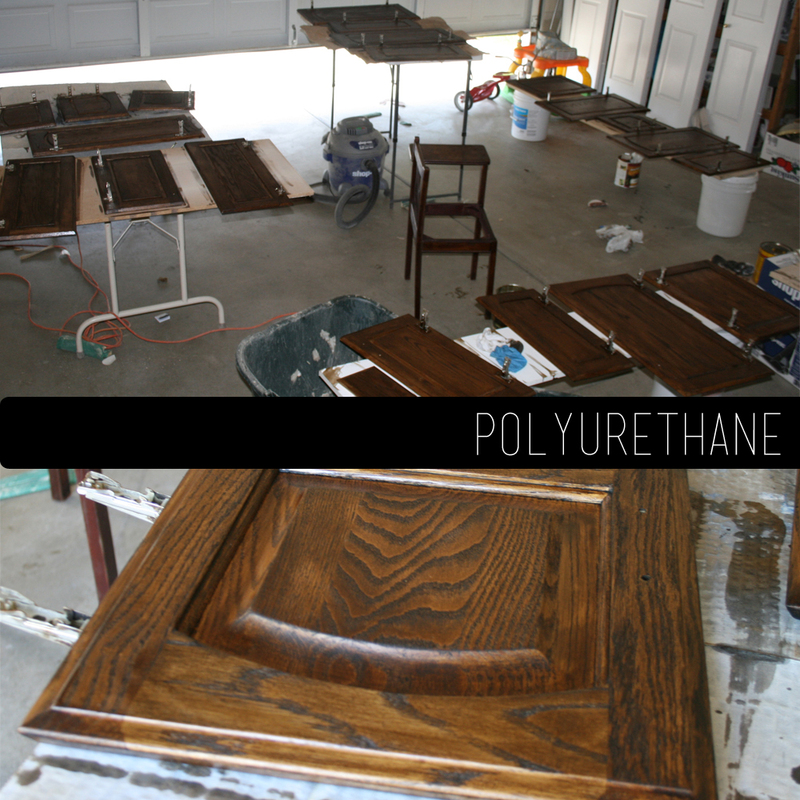 Apply polyurethane when the cabinets are clean and dry. Use a synthetic bristled brush and use even strokes. Paint with the wood grain and try not to go over it more than two times. Let the first coat dry according to the instructions on the back of your poly. We waited four hours to recoat. Lightly sand the wood's surface with a super fine grit sand paper. You'll see a light powder appear on the surface. This step is awful because you'll think you've ruined everything by sanding, but you haven't. Trust me. Remove the fine powder with a dry rag. Repeat the steps until you're satisfied. We applied three coats. 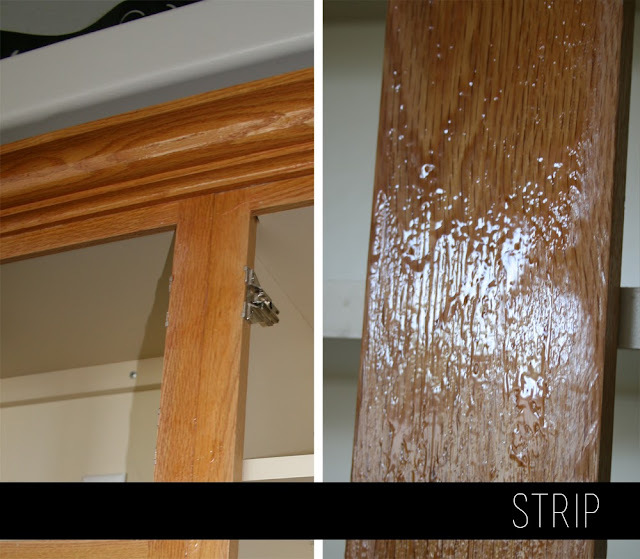 Clean any excess stain or poly off of hinges, shelves, walls, etc with mineral spirits. If you've done the appropriate prep you won't have to do much cleanup. Let your doors cure for at least two or three days after they're dry before you add new hardware. Optional: I painted my corner cabinet blue to give the kitchen a little more color. Optional: The counter trim was still the horrible honey oak color, so I painted it the same gray as the walls. Not bad for a total kitchen overall, am I right? Maybe someday we'll do something about the counters, but for now, they're fine. What do you think? Do you see a potential kitchen overhaul in your future? P.S. This kitchen re-do was a lot of hard work, and I want to especially thank my parents for being there to help me! My dad and I spent hours and hours and hours in the garage together sanding, staining, cleaning, polyurethaning. My mom not only helped in the whole process, but she was moral support and the baby watcher! Thank you parentals!! I couldn't have done it without you. Awww! Love the thanks at the end. I painted my cabinets last fall. I sanded them all white but skipped the stripping part....too much work for me! 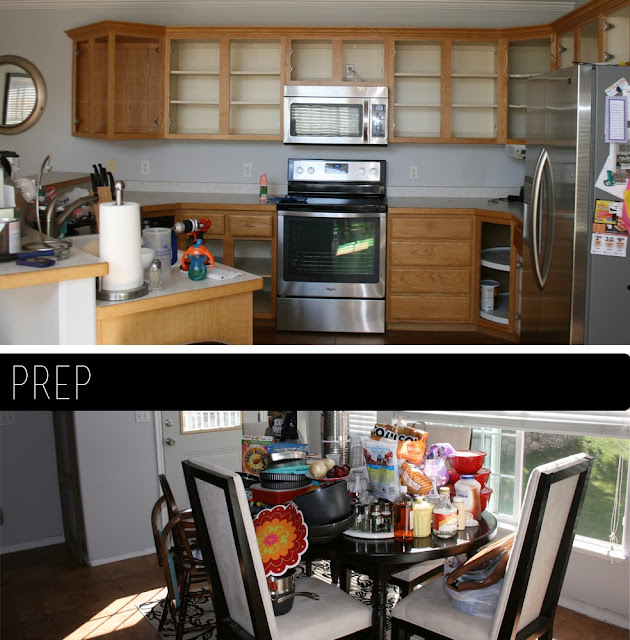 Painting your entire kitchen is still a TON of work! Good for you! I would love to see pictures. amazing. you do great work! Love the new look! This is something I have been putting off. I don't know if I want to paint. I definitely like the stain look, plus I think it would hold up better than paint. You can totally do it! If you do, send pictures my way. I'd love to see it! Great job. I love the darker wood tones. 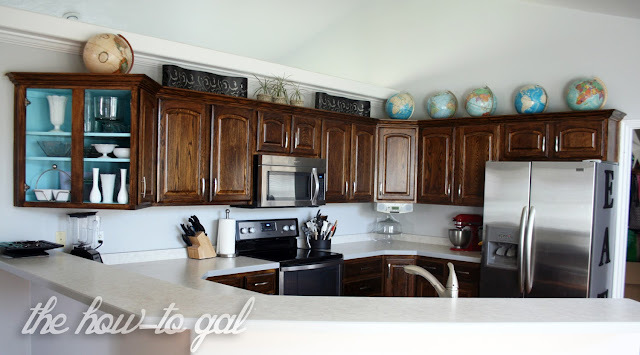 I'm not a big fan of painting the cabinets as I love the warm look of wood. 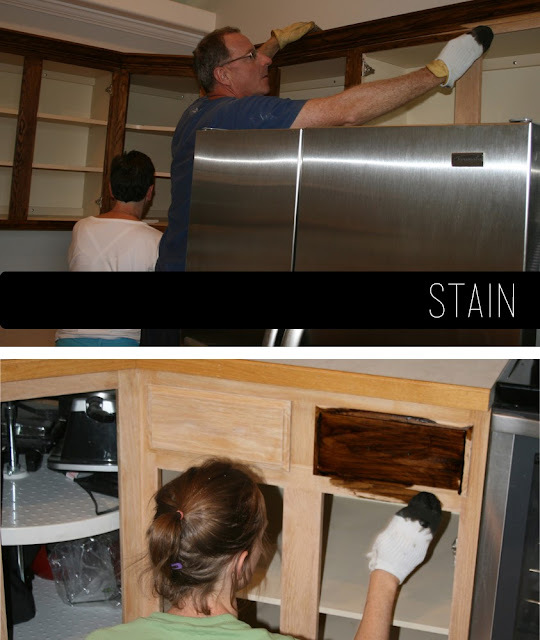 Staining them is a great way to update them and something people don't do very often (at least compared to all the white painted cabinet makeovers you see on Pinterest) :) Thanks for sharing. What color stain did you use? It's beautiful! Heidi, we used Minewax Dark Walnut- my absolute favorite color! Are you planning on refinishing something in the future? They come in numerous shades now and you can think of your own thoughts. On the off chance that you can take pictures of a few floors you have finished, you can have a pleasant little portfolio you can Floor refinishing demonstrate new clients to get considerably more work later on.